During his visit on Argus, President Koroma was joined by Paolo Conteh, a retired major in the Sierra Leone Armed Forces and defense minister who now serves as CEO of the National Ebola Response Center. Also in attendance were Alex Bonapha, chairman of Kailahun District and Saddiq Sillah, chairman of Pujehun District. Both districts have been Ebola free for more than 100 days. “Thank you to you the Royal Navy. Thank you to the British Government, and thank you to the British people for providing us with the support at this very difficult moment of our country’s history," President Koroma said. “We are now on the road to zero. Until we get to zero and stay zero for forty-two days we will still be within a situation of Ebola. But I am sure with what we have learned, with the continued support that you are providing we will get out of it,” the president said. 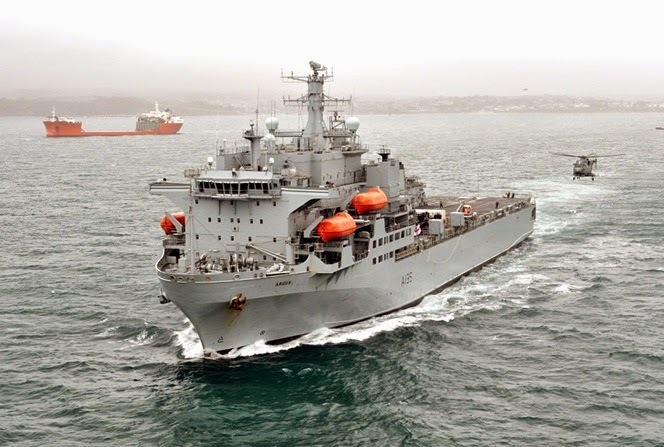 With the return of RFA Argus, the number of military personnel in Sierra Leone will be at around 300. This contribution is made up of command and control, logisticians, planners and medics. Argus’ capabilities have been transferred to other agencies which are well placed to take on the roles. “RFA ARGUS arrived in Sierra Leone during the difficult days when cases of Ebola were rising and above 500 cases per week. Speed was of the essence in building the capacity of the country to deal with the outbreak. This included the building of Ebola Treatment Centers and importantly command and control functions. The ability of RFA Argus to move people and equipment by helicopter and boat has been very important to achieving this and it has enabled development of the operation both nationally and in the districts.